"Antonio Banderas (Desperado), Jonathan Rhys Meyers (Mission: Impossible III), and Piper Perabo (The Prestige) highlight this riveting adaptation of an acclaimed French thriller. 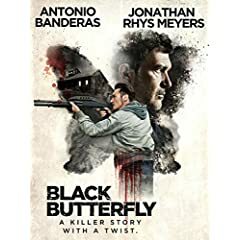 As a serial killer’s latest slaying shakes up a remote Colorado town, desperate writer Paul (Banderas) offers drifter Jack (Meyers) shelter at his isolated cabin. Does Jack’s violent behavior make him a suspect in the murders menacing the area? Or is the killer’s story even more terrifying?" That is the official description for Black Butterfly, now available on Blu-ray, DVD and Digital from Lionsgate, which has provided NewTechReview with a NFR copy for review. What starts off as a decent thriller, in my opinion, Black Butterfly is effectively ruined by the cliched plot twist at the end. The first scene of the film where a woman is abducted and murdered sets the tone of the film, although you won't find any blood or gore here, it's all psychological. We're then introduced to the once famous but now failing book writer Paul (Banderas) who has a run-in with a truck driver, but is saved by a young stranger named Jack (Meyers). Jack is a drifter and Paul offers him a place to stay for the night. As the story continues, things become more and more implausible as Jack's behavior turns violent, but Paul allows him to stay. There are actually two twists to the story and I figured out the first one about half-way through the film. If they had left it at that, then I could say Black Butterfly was a somewhat worthwhile thriller, since many of the implausibilities are explained with the first twist. However, the additional cliched twist at the end simply ruins the entire experience. The Blu-ray version of the film is presented with a MPEG-4 AVC encode and an aspect ratio of 2.39:1. The picture is nicely shot with a cool color palette, which is especially noticeable in the outdoor nature scenes. Indoor scenes can be a bit dark at times, but that may have been intentional given the mood of the film. The audio is a DTS-HD Master Audio 5.1 track, the majority of which is dialogue, but there is some good use of the surround channels for ambience. There are two bonus features provided including Audio Commentary with Director Brian Goodman and Co-Writer Marc Frydman, as well as Black Butterfly Backstage which is a featurette showcasing a behind-the-scenes look at the making of the film. Black Butterfly is one of those "love it" or "hate it" films where you really enjoy the strange story with its twists and turns or you hate it for the fact that it seems very implausible and is ruined by the final twist at the end. I'll leave it to you to decide whether or not you want to watch.